Maybe it’s the fact that I don’t really watch very many movies that randomly results in me seeing ones from the competent-to-awful end of the quality rainbow. 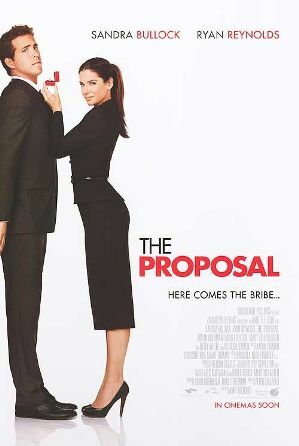 The Proposal certainly could have been worse, and it certainly could have been better. Right up front I’ll say that I almost always like Sandra Bullock. I haven’t seen every movie she’s made, because some of them look perfectly terrible, and there’s not that much free time in life, but she’s a comforting presence. She’s fine here as a brittle book executive who faces deportation to Canada because she’s let her visa paperwork lapse. Because that’s what demanding executives do… put major aspects of their professional life in jeopardy because they’re so bad with details. In Alaska, we meet Reynolds’s controlling father, played by Craig T. Nelson, who wants his son to give up this damned fool book editor dream and come back to Alaska to run the family empire. There’s also Reynolds’s mother, played Mary Steenburgen, looking composed and beautiful and just slightly quirky enough to keep you alert, which is what you hire Mary Steenburgen to do, because there’s really nobody better at it. And… sigh… there’s Betty White, forced to move through a bunch of “rapping granny” set pieces where old people are portrayed as being hilarious because they don’t sit in chairs and talk sentimentally about “the war.” I love Betty White, don’t get me wrong, but the nicest thing I can say about her character here is that she looks younger than her son. Props to Nelson for not succumbing to a Botox-addicted culture of youth, but wow, dude looks rough. Here’s why the movie is just kind of competent for me. It feels like it was originally written to be about a woman and her gay male assistant concocting a sham marriage instead of a woman and her straight male assistant falling in unlikely love. It doesn’t seem like anyone made much effort to shift the narrative from straight-gay frenemy picture to opposites-attract romance. I have no idea if this actually happened, but that’s how it reads on screen, particularly Reynolds’s relationship with his parents. He resents his father for not supporting who he is, and his mother is angry at her husband’s inflexibility for necessitating so much distance from their son. I’m not really sure what to make of Reynolds. Lots of reviews talked about the great chemistry he and Bullock had in this movie, and I didn’t really see it. They were amiable enough together, but Bullock can muster chemistry with just about anyone. Also, Reynolds’s eyes are kind of strange in that emotion doesn’t seem to reach them all the time. They’re a little dead. On an unrelated but gross note, there’s a line at the end where some background character urges Reynolds to “show [Bullock] who’s boss,” which almost manages to undo the fact that the rest of the movie didn’t totally degrade Bullock’s character for being a competent if aggressive professional. As everyone knows, he’ll be playing Green Lantern in a big action movie. I don’t really have an opinion about this, because super-hero movies are almost always boring, and I’ve never had much interest in Green Lantern to begin with, unless we’re talking about the dive-y, bear-friendly bar in Washington, D.C. Speaking of Green Lantern’s trip to cinemas, I think that’s pretty much one of the big two accomplishments of DC’s Diane Nelson, which is among the big comic stories Tom Spurgeon identifies for the next few months. Well, that and hacking away at DC’s imprints and product variety, but that’s a topic for another day. You are currently browsing the The Manga Curmudgeon blog archives for the day Monday, August 2nd, 2010.